For the Cubs Fan Extraordinaire. 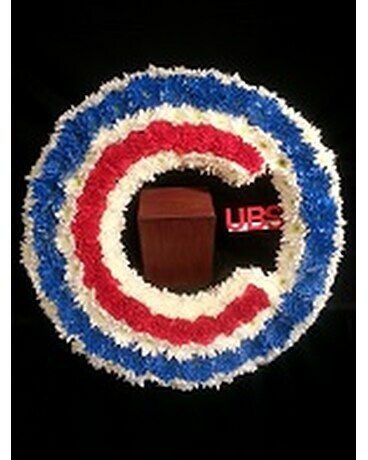 This Cubs Memorial Wreath can be made as a table piece in which to place the urn, (as shown) or on an easel to be placed near the casket. Exclusively designed and hand crafted by Roselle Flowers. This item is available for delivery in the Chicago Metro Area, as it is a Roselle Flowers custom design. Please contact us by phone to order.